The Path of Love is a deep and profound journey into the heart of you. It teaches you how to come into loving embrace of yourself through three very important steps. The first step is to acknowledge and honor all that you are. The second step is to accept all that you are - shadow and the light. The third step is to embrace the master self within and follow its guidance. The Path of Love opens you to the energy of creation that is in abundance all around you. It asks you to accept the divine within you and to honor the divine all around you. This path asks you to let go all the stories that you are attached to that create separation in your life. It is on this path that you begin to see all the possibilities that are open for you and come to know that each choice you make brings you close to your divine power. The Path of Love is a deep path of self discovery and when you walk this path with a group of like-minded students you are deeply supported as you share together. The Path of Love is the road home to all that you are. A welcome letter with your personal focus for this level of the course. 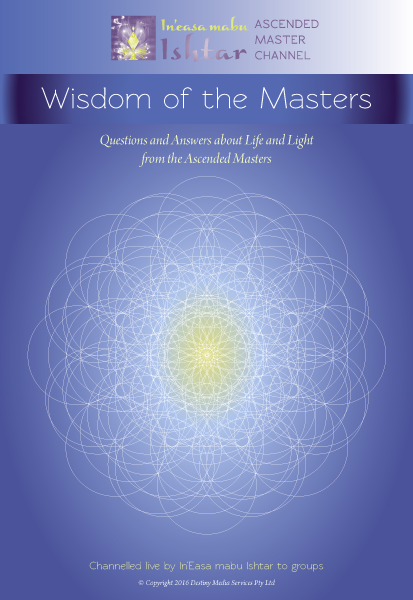 In most cases your 3 Masters remain the same for this level as for the Path of Light. 33 Lessons on the Path of Love from the Ascended Masters including Lady Mary, Lord Maitreya, Divine Mother, Quan Yin, Lord Buddha, Saint Germain, Lady Venus, Lady Nada, Lord Melchizedek, and Lord Kuthumi. 13 personal chapters written by Ishtar about her experiences on the Path of Love with practical information and guidance to follow. 17 Chapters with Tools of Assistance including - Power of the Mind, Monads and Souls, The Light Body, Seven Lower Bodies, Five Higher Bodies, The Chakras, 12 Universal Rays, Karma, Universal Laws, Basic Energy Work, Resolving Aspects, Light Technology, Ascended Master Tools, Decrees, and Affirmations, Power of Mantras. If you wish to have more information please contact Ishtar.